Charlotte, N.C. (May 24, 2013) – Make plans to join SPEED Energy Stadium SUPER Trucks on the biggest weekend in motorsports, as NBC Sports brings the high flying door to door racing action into homes all across the United States this Memorial Day weekend. 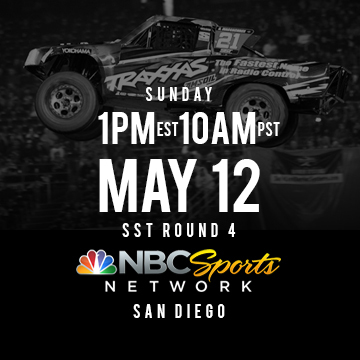 NBC Sports Network will air all the excitement for fans to enjoy this Saturday, May 25, at 12:30 pm EST / 9:30 am PST for an extended 90 minute special highlighting the Stadium SUPER Trucks Grand Prix of Long Beach and Round No. 5 from Qualcomm Stadium. Watch how the custom designed 600 hp trucks became the crowd favorite on the streets of Long Beach, Calif., as well as the epic battle that erupted during Round No. 5 of competition in San Diego, Calif., between veteran off-road racer Robby Gordon and 15 year-old local young gun, Sheldon Creed. See the two drivers fight it out for the $40,000 first place prize in thrilling fashion. Check your local listings for exact times and channels. The Inaugural season of SPEED Energy Stadium SUPER Trucks continues Saturday night, June 8, in St. Louis, Mo., at the Edward Jones Dome with a full slate of Stadium SUPER Trucks, Monster Trucks, SUPER Buggy, and SUPER Trophy Kart racing on a specially designed course. Tickets to SPEED Energy Stadium SUPER Trucks at the Edward Jones Dome start at just $20 for adults, with military personnel and kid’s 12 & under receiving $10 off with a purchased adult ticket from the Edward Jones Dome box office or through Ticketmaster at ticketmaster.com or 800-745-3000. Charlotte, N.C. (May 9, 2013) – On Saturday night, May 4, SPEED Energy Stadium SUPER Trucks took to the ultra-challenging dirt and asphalt course for the first of two events held at Qualcomm Stadium in the month of May. NBC Sports will bring all the excitement and action to SST fans this Sunday at 1 pm EST / 10 am PST as Round No. 4 will be aired on the NBC Sports Network all across the United States. Watch an epic battle form between top drivers Robby Gordon, Ricky Johnson and point’s leader Rob MacCachren as they fight for the $40,000 first place prize. Check your local listings for exact times and channels. The Inaugural season of SPEED Energy Stadium SUPER Trucks continues Saturday night, May 18, with the return to Qualcomm Stadium for Round No.5 competition, with a slew of racing divisions plus the newly added SUPERMoto bikes. All taking place on a brand new course set to test the driver’s skill and endurance. Tickets to SPEED Energy Stadium SUPER Trucks at Qualcomm Stadium start at just $25 for adults with kid’s 12 & under are $10 off with a purchased adult ticket at the stadium box office or through Ticketmaster at ticketmaster.com or 800-745-3000. A special for Armed Forces Day on May 18! Military personnel tickets are just $10 by showing their Military ID cards at the stadium box office or other ticket purchasing locations. Robby Gordon OFF-ROAD is a new breed of off-road featuring live motorsports, bringing back what was once the concept of legendary racer Mickey Thompson. Robby Gordon’s new concept of Stadium SUPER Trucks involves high-powered off-road trucks racing side-by-side on challenging dirt tracks consisting of huge jumps, crossovers and tight corners. The Series is comprised of 12 heart-pounding events providing motorsports action in the greatest venues in the world. Professional drivers compete for a huge Championship purse, the biggest in off-road today. Other classes involve BIGFOOT® Monster Trucks, SUPER Trophy Karts, SUPER Buggy, and SUPERMoto racing, all held in stadiums that will keep you on the edge of your seat! How are you watching the event from Qualcomm Stadium? Find out how to watch from wherever you are. (All times are listed in Eastern Standard Time unless otherwise noted.) Times are subject to change. WATCHING FROM HOME ON MAY 12? Use the hashtag #SSTonNBC on Twitter & Instagram to follow along and watch the race with us! Tell us what you think. Watch top drivers Robby Gordon, Ricky Johnson and Points Leader Rob MacCachren battle it out for $40,000! * DISCLAIMER: If you wish to not know what the results are and wait for them to air on TV stay away from Social Media! GOING TO THE RACE ON MAY 18? Want to attend the race next weekend at Qualcomm Stadium? Buy tickets to Round 5 San Diego HERE. Also click HERE to find our where you can find other ticket purchasing locations besides the Stadium Box Office and Ticketmaster. Join us for FOOD, BEER, BANDS and BABES! A live band will be performing during the afternoon as well as the Miss SST Judging Contest where you the Fan get a chance to root on your favorite Miss SST contestant! Wanna meet a driver? The SST Pits will open at 2:00PM PST and you can feel just like a crew member. Get up close and personal with drivers and their teams plus take a closer look at all the vehicles racing including BIGFOOT® Monster Trucks, SUPER Buggys, SUPER Trophy Karts, SUPERMoto Bikes and Stadium SUPER Trucks. San Diego CA (May 8, 2013) – USA Pro Supermoto is pleased to announce a new partnership between USA Pro SUPERMoto and SPEED Energy Stadium SUPER Trucks Series (SST) to hold pro SUPERMoto racing events together for the remainder of the 2013 race season. Stadium SUPER Trucks (SST) will begin featuring USA Pro SUPERMoto racing action at select Stadium SUPER Trucks events this summer starting with the SST event at Qualcomm Stadium on May 18th. For this first event, USA Pro SUPERMoto will be holding an exhibition race on the stadium floor of Qualcomm Stadium during the 5th round of the Stadium SUPER Trucks Series on May 18th. This USAPSM event, hosted by Robby Gordon OFF-ROAD, will include a USA Pro SUPERMoto Invitational race featuring some of the top pro supermoto riders in the country. The list of racers in attendance will include; Las Vegas’s Derek Costella, Riverside’s Dustin Hoffman, Denver’s Tim Velasquez, and Newport Beach’s own Brandon Ward. Brandon’s father Jeff Ward, a former AMA SUPERMoto Champion himself, will also be in attendance piloting the No.4 Truck in the SST class. SPEED Energy Stadium SUPER Trucks is modeled after Mickey Thompson’s Off-Road Race Series from the 1990’s, and features stadium racing inside large stadium venues like the L.A. Coliseum, the Metro Dome, Qualcomm Stadium, Georgia Dome and more. SST features modern day race courses constructed of both asphalt road course sections and high flying dirt obstacles. This program is what provided the perfect layout to bring and feature USA Pro SUPERMoto racing. The action-packed event which is anticipating over 20,000 spectators will feature a fan expo during the day, a party in the pits, followed by BIGFOOT® Monster Truck racing, SUPER Trophy Karts, SUPER Buggy, SUPERMoto and the Stadium SUPER Trucks to cap off an exciting evening of high-flying racing action. USA Pro SUPERMoto looks forward to the partnership and will have more info on upcoming USA Pro SUPERMoto/SST combined events in the very near future. San Diego, Calif. (May 4, 2013) – SPEED Energy Stadium SUPER Trucks invaded Qualcomm Stadium in San Diego, Calif., for a full night of racing action with four distinct divisions testing their skills on the uniquely prepared high flying dirt and asphalt course. Rob MacCachren, Dan Runte, Apdaly Lopez, and Myles Cheek were able to conquer the multiple challenges of the most difficult course this year to record wins in Round No. 4 of SST competition. Rob MacCachren, of Las Vegas, Nev., driving the #21 Traxxas was able to make a last lap pass on leader Ricky Johnson en route to capturing his second SPEED Energy Stadium SUPER Trucks victory of the season. The 20-Lap SPEED Energy Stadium SUPER Trucks final began from a staggered start and saw first place starter Ricky Johnson from El Cajon, Calif., quickly jump out to the early lead navigating his way through the sand option. Point’s leader, Rob MacCachren decided to try the cross-over option in hopes of gaining the lead. Coming up short the No. 21 would file into the second position. Bristol, Va., native Justin Matney driving the No. 8 RPM Off-Road truck found trouble early in Lap-2 becoming stuck in the sand pit losing multiple positions and eventually dropping out of competition. By Lap-6, Johnson and MacCachren drove out to a commanding lead of the other competitors, but disappeared one lap later as the red flag flew for Justin Lofton’s rolled over Solar City truck. On the restart, Orange, Calif., native Robby Gordon wasted no more time working his way to the front, opting to use the crossover option and taking the lead away from Johnson in the tight hairpin. In just one lap, Gordon pulled out to a five truck lead ahead of Johnson and MacCachren. The lead did not last for long as the handling on Gordon’s truck began to go away as Johnson closed the margin on Lap-14. Johnson would find trouble two laps later in the hairpin loosing valuable ground to Gordon and blocking multiple trucks behind him, causing P.J. Jones of Scottsdale, Ariz. to flip over in the chaos. On the restart, Gordon raced back out to the lead, but found trouble soon after getting stuck in a large rut. Johnson would regain the lead coming to the white flag followed by MacCachren and Gordon. Coming down the final stretch Johnson tried to fight his way through the dirt with a right rear tire going down as MacCachren passed him for the lead coming to the final corner. MacCachren raced the No. 21 Traxxas truck to the Round No.4 victory ahead of Johnson and third place finisher Robby Gordon. Apdaly Lopez manged to shake the mechanical woes of the previous two races to take the lead on Lap 7 en route to taking his first SST win in the 12-lap SUPER Buggy final. Phil Bollman and Cole Belio started the 12-lap SUPER Buggy final and raced around the challenging course. Rick Welch made contact with another driver and became stalled on top of the k-rail entering the sand. Bollman was in control of the fast paced race, until a tangle with Eddie Tafoya and Eric Jacobus in the hairpin caused Bollman to slip back to the sixth position. Lopez managed to steer away from the collision and drive into the lead. Bollman would find trouble again on final lap flipping over and stalling Tafoya in the sand. Lopez drove away to capture the win over Eric Jacobus and third place finisher Michael Ward. Other winners included Dan Runte driving Summit Racing Equipment BIGFOOT over Eric Swanson’s LAT Oil No. 103 in the Monster Truck division; Myles Cheek, bested 13 competitors in the SUPER Trophy Kart division. 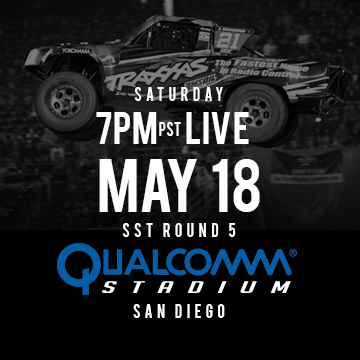 The Inaugural season of SPEED Energy Stadium SUPER Trucks continues Saturday night, May 18, in San Diego, Calif., at Qualcomm Stadium with a full slate of Stadium SUPER Trucks, Monster Trucks, SUPER Buggy, and SUPER Trophy Kart racing on a redesigned course. A special for Armed Forces Day on May 18th! Military personnel tickets are just $10 by showing their Military ID cards at the stadium box office or other ticket purchasing locations. All 11 SPEED Energy Stadium SUPER Truck events in 2013 will be televised on weekends and featured on NBC Sports: seven on NBC and five to be televised on the NBC Sports Network. Round No. 4 from Qualcomm Stadium in San Diego, Calif., will be shown on Sunday, May 12 at 1 P.M. ET. on NBC Sports Network. Please check your local listings for channel. Stadium SUPER Trucks Final (20 Laps): 1. Rob MacCachren; 2. Ricky Johnson; 3. Robby Gordon; 4. Arie Luyendyk Jr.; 5. P.J. Jones; 6. Lalo Laguna; 7. Adrian Cenni; 8. Jeff Ward; 9. Justin Lofton; 10. Sheldon Creed; 11. Mike Jenkins; 12. Nick Baumgartner; 13. Justin Matney; 14. Jerett Brooks. Monster Truck Final: 1. Dan Runte; 2. Eric Swanson. SUPER Buggy Final (12 Laps): 1. Apdaly Lopez; 2. Eric Jacobus; 3. Michael Ward; 4. Eddie Tafoya; 5. Rob Archibald; 6. Phil Bollman; 7. Rick Welch; 8. Cole Belio. SUPER Trophy Kart Final (12 Laps): 1. Myles Cheek; 2. Eliott Watson; 3. Broc Dickerson. Stadium SUPER Trucks LCQ (8 Laps): 1. Robby Gordon; 2. Sheldon Creed; 3. Jerett Brooks; 4. Mike Jenkins; 5. Arie Luyendyk Jr.; 6. Adrian Cenni; 7. Nick Baumgartner. Stadium SUPER Trucks Heat 1 (10 Laps): 1. Justin Lofton; 2. Rob MacCachren; 3. Jeff Ward; 4. Robby Gordon; 5. Arie Luyendyk Jr.; 6. Sheldon Creed; 7. Mike Jenkins. Stadium SUPER Trucks Heat 2 (10 Laps): 1. P.J. Jones; 2. Ricky Johnson; 3. Justin Matney; 4. Adrian Cenni; 5. Jerett Brooks; 6. Nick Baumgartner; 7. Lalo Laguna. San Diego, Calif. (May 5, 2013) – SPEED Energy Stadium SUPER Trucks made the two-hour drive down Interstate-5, bringing the 600 hp off-road road show inside Qualcomm Stadium in San Diego, Calif. for a night of practice and qualifying. After a very brief practice, the Stadium SUPER Trucks took to the very unique and challenging course for a best of 3-laps qualifying session. The first group contained the top three in the SST championship point tandings Orange, Calif., native Robby Gordon, Justin Lofton of Brawley Calif., and current point leader Rob MacCachren of Las Vegas, Nev.
Gordon began the session laying down the quickest time of the evening with a 36.828, a time that would end up remaining on top of the leader board the rest of the night. MacCachren would find trouble on lap-2 lightly flipping over in the sand pit. On the restart Lofton found trouble as well spinning out and pulling off the track on the final circuit. Sheldon Creed, of Alpine, Calif., making his first appearance in a SPEED Energy Stadium SUPER Truck would turn everyone’s head laying down a remarkable lap 37.433 good for second place behind leader Gordon. However, that did not last long as Lalo Laguna of Mexi Cali Baja, Mexico would record a lap time of 37.385 over taking Creed for the second position. The remaining competitors were unable to match the first lap recorded by Gordon as he went on to win his second straight SPEED Energy Stadium SUPER Trucks fast qualifier award and the one point bonus towards the 2013 SST Championship. SPEED Energy Stadium SUPER Trucks Round #4 at Qualcomm Stadium will begin with the Ultimate OFF-ROAD Expo starting at 12:30 pm. Fans can get inside the interactive area for $10 or recycle an empty SPEED Energy Drink can for FREE ADMISSION. Pits will be open to all fans inside the Ultimate Off-ROAD Expo at 2 PM concluding with a fan track walk featuring an on track driver autograph session. Racing will begin at 7 PM with Monster Truck heat races followed by SUPER Buggy heats and Stadium SUPER Trucks heats. SUPER Trophy Karts will hit the track before the all the 3 classes Main Events. Keep up with all the latest news and results on SPEED Energy Stadium SUPER Trucks Series by liking the series on Facebook at http://facebook.com/StadiumSuperTrucks as well as following on Twitter at http://twitter.com/SSuperTrucks. All information including where to purchase your tickets for the 2013 season can be found at http://www.stadiumsupertrucks.com. Stadium SUPER Trucks Qualifying (Best of 3 Laps): 1. Robby Gordon 36.828; 2. Lalo Laguna 37.385; 3. Sheldon Creed 37.433; 4. Nick Baumgartner 37.531; 5. Rob MacCachren 38.067; 6. P.J. Jones 38.358; 7. Justin Lofton 38.390; 8. Adrian Cenni 39.178; 9. Jeff Ward 39.409; 10. Jerett Brooks 39.458; 11. Mike Jenkins 39.540; 12. Justin Matney 40.006; 13. Arie Luyendyk Jr. 40.247; 14. Ricky Johnson DNS. Los Angeles, Calif. (April 28, 2013) – Making its return to the birthplace of stadium off-road racing SPEED Energy Stadium SUPER Trucks invaded the Los Angeles Memorial Coliseum for a full night of racing action with three distinct divisions testing their skills on the uniquely prepared high flying dirt and asphalt course. Robby Gordon, Larry Swim, and Jerry Whelchel were able to conquer the multiple challenges to record wins in Round No. 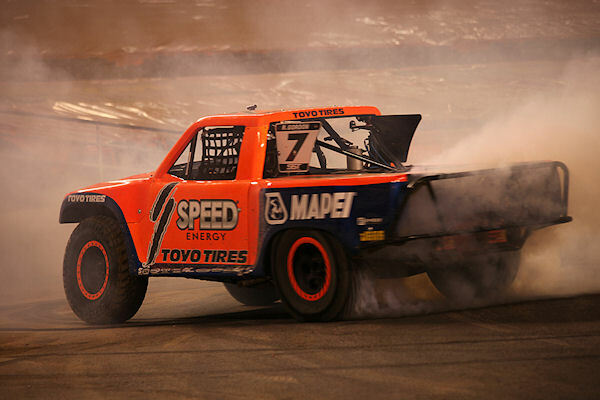 3 of SST Competition.Robby Gordon, of Orange, Calif., driving the #7 SPEED Energy / MAPEI / Toyo Tires truck held off points leader Rob MacCachren to capture his first win in Stadium SUPER Trucks history. The 20-Lap SPEED Energy Stadium SUPER Trucks final began from a staggered start and saw first place starter Gordon jump out to the early lead. Entering turn 1, third place starter Ricky Johnson of El Cajon, Calif., opted to test the cross-over option for a chance to take the over the lead. Not going as planned Johnson’s evening quickly came to an abrupt end as a flat tire resulted in getting him off course in the middle of the peristyle. Trouble also found Jeff Ward on the opening lap as he became stuck in the sand step-up resulting in losing multiple laps to the leader. Rob MacCachren wasted no time moving from his fourth starting position, quickly moving into the second spot. Gordon led the pack back to the start-finish line for the opening lap ahead of MacCachren and Brawley, Calif., native Justin Lofton. The following laps saw the lead drivers hold their positions and race incident free for 8-laps. Caution flew on lap-10 following a re-start where Gordon raced back out to four truck length lead ahead of McCachren and Lofton. Arie Luyendyk Jr. found trouble rounding the last corner of Lap-12 resulting in a roll over on the side of his No. 25 machine bringing out a full course red flag. On the re-start, Justin Lofton running in third place lost the handle on the Solar City No.6 rounding the peristyle resulting in loosing multiple positions back to fifth place. Phoenix, Ariz., native P.J. Jones, would capitalize on the Lofton’s misfortune moving up into third position. Trouble found Lofton once again on lap-16 as the hard charging Lofton made contact with Iron River, Mich., driver Nick Baumgartner exiting the chicane causing extensive damage to the front end of his race truck. The damage resulted in the No. 6 to lose the hood and drop out of competition one lap later. Gordon raced the #7 SPEED Energy / MAPEI / Toyo Tires truck to the Round No.3 victory ahead of MacCachren and P.J. Jones. Jerry Whelchel, the only competitor to compete in every single Mickey Thompson Entertainment Group event made his return to stadium racing a successful one taking the lead on Lap 3 en route to taking the win in the 10-lap SUPER Buggy final. Adrian Cenni and Apdaly Lopez started the 12-lap SUPER Buggy final and raced around the challenging course until Lopez stalled on the front stretch of lap-3. Cenni, of New York, NY fell back several positions after making contact with another driver. While trying to make up lost position, Cenni chose the cross-over jump and landed hard breaking the right front suspension. Cenni would drop out on lap-5 after Rino Navero would jump over the concrete retaining wall brining out the red flag. Welchel went on to capture the win over Tyler Winburry and third place finisher Phil Bollman. The Monster Truck Final saw Larry Swim driving the SPEED Energy BIGFOOT defeat BIGFOOT No.15 Darron Schnell in a close matched Chicago style duel. The Inaugural season of SPEED Energy Stadium SUPER Trucks continues Saturday night, May 4, in San Diego, Calif. at Qualcomm Stadium with a full slate of Stadium SUPER Trucks, Monster Trucks, SUPER Buggy, and SUPER Trophy Kart racing. Stadium SUPER Trucks Feature (20 Laps): 1. Robby Gordon; 2. Rob MacCachren; 3. P.J. Jones; 4. Nick Baumgartner; 5. Justin Matney; 6. Lalo Laguna; 7. Mike Jenkins; 8. Greg Adler; 9. Justin Lofton; 10. Adrian Cenni; 11. Arie Luyendyk Jr.; 12. Jeff Ward; 13. Ricky Johnson. Monster Truck Final: 1. Larry Swim; 2. Darron Schnell. SUPER Buggy Feature (12 Laps): 1. Jerry Whelchel; 2. Tyler Winbury; 3. Phil Bollman; 4. Eric Jacobus; 5. Eddie Tafoya; 6. Rino Navero; 7. Adrian Cenni; 8. Apdaly Lopez; 9. Steven Arlia; 10. Kyle Quinn. Stadium SUPER Trucks LCQ (6 Laps): 1. Justin Lofton; 2. Greg Adler; 3. Nick Baumgartner; 4. Mike Jenkins; 5. Adrian Cenni; 6. Jeff Ward; 7. Justin Matney. Stadium SUPER Trucks Heat 1 (8 Laps): 1. Arie Luyendyk Jr.; 2. Ricky Johnson; 3. Robby Gordon; 4. Nick Baumgartner; 5. Mike Jenkins; 6. Justin Matney; 7. Justin Lofton. Stadium SUPER Trucks Heat 2 (8 Laps): 1. P.J. Jones; 2. Rob MacCachren; 3. Lalo Laguna; 4. Greg Adler; 5. Adrian Cenni; 6. Jeff Ward. SUPER Buggy Heat (6 Laps): 1. Adrian Cenni; 2. Apdaly Lopez; 3. Jerry Whelchel; 4. Tyler Winbury; 5. Rino Navero; 6. Eddie Tafoya; 7. Eric Jacobus; 8. Phil Bollman; 9. Steven Arlia; 10. Kyle Quinn. Los Angeles, Calif. (April 27, 2013) – SPEED Energy Stadium SUPER Trucks made the return to the birthplace of Stadium truck racing on a specifically designed dirt and asphalt course inside the Los Angeles Memorial Coliseum in Los Angeles, Calif.
Mike Jenkins began the qualifying session, running 3 smooth laps. Next was Lalo Laguna as he blistered a quick lap of 42.123 jumping to top of the charts. Laguna remained the quick qualifier throughout much of the event even after successful laps by off-road new comers Arie Luyendyk and Nick Baumgartner. P.J. Jones found trouble on his third qualifying lap turning the American Racing Wheels No. 98 over on its side. The Solar City No. 6 of Justin Lofton continued his qualifying ways jumping to the top position with a 41.773. Lofton’s, quick time did not last long as Robby Gordon in the SPEED Energy / MAPEI / Toyo Tires truck came out racing its way to the fastest lap time of the day with a 40.620. “To be fast qualifier at the Los Angeles Memorial Coliseum is pretty cool; we’ve had Lofton as the quick qualifier twice this year. Tonight Lofton came out and qualified third putting the both of us in the same heat race tomorrow night. Heading into Round #3 the race for the SST Championship is very close. Point Leader Rob MacCachren qualified second tonight setting up a great battle for the points lead tomorrow night. There is nothing like being at the coliseum and flying down the peristyles.” Said fast qualifier Gordon. SPEED Energy Stadium SUPER Trucks Round #3 at the Los Angeles Memorial Coliseum will begin with the Ultimate OFF-ROAD Expo starting at 12:30 pm. Fans can get inside the interactive area for $10 or recycle an empty SPEED Energy Drink can for FREE ADMISSION. Pits will be open to all fans inside the Ultimate Off-ROAD Expo at 2 PM concluding with a fan track walk featuring an on track driver autograph session. Racing will begin at 7 PM with Monster Truck heat races followed by SUPER Buggy heats and Stadium SUPER Trucks heats. SUPER Trophy Karts will hit the track before the all the 3 classes Main Events. Be sure to be there to watch history return to the coliseum. Tickets to SPEED Energy Stadium SUPER Trucks at the Los Angeles Memorial Coliseum start at just $25 for adults and kid’s 12 & under ARE FREE with a purchased adult ticket at the stadium box office or through Ticketmaster at ticketmaster.com or 800-745-3000. All college students can buy tickets for $10 through the stadium box office by simply showing their student ID’s. All 11 SPEED Energy Stadium SUPER Truck events in 2013 will be televised on weekends and featured on NBC Sports: seven on NBC and five to be televised on the NBC Sports Network. Round #3 from the Los Angeles Memorial Coliseum in Los Angeles, Calif. will be shown the day after the race on Sunday, April 28 at 1 P.M. ET. on NBC Sports Network. Please check your local listings for channel. Stadium SUPER Trucks Qualifying (Best of 3 Laps): 1. Robby Gordon 40.620; 2. Rob MacCachran 41.428; 3. Justin Lofton 41.773; 4. Lalo Laguna 42.123; 5. Nick Baumgartner 42.282; 6. Greg Adler 42.332; 7. Ricky Johnson 42.608; 8. Jeff Ward 42.660; 9. Arie Luyendyk 42.746; 10. Mike Jenkins 43.137; 11. Adrian Cenni 43.271; 12. P.J. Jones 44.226; 13. Justin Matney 45.163.